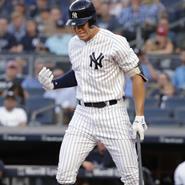 The hopes of the New York Yankees of winning the A.L East took a big blow last night after All-Star right-fielder Aaron Judge suffered a chip fracture in his right wrist during the game against the Kansas City Royals. The injury happened when Royals starter Jakob Junis hit him in the wrist during Judge’s at-bat in the first inning. The 2017 Rookie of the Year stayed in the game and even took a second at-bat in the third inning before Miguel Andujar pinch-hit for him in the fourth. After seeing the team physician, Dr. Chris Ahmad, Judge was sent to New York Presbyterian Hospital for an MRI exam and CT scan. The Yankees later confirmed that the slugger suffered a broken ulnar styloid bone in his right wrist and although surgery won’t be required he won’t be able to swing a bat for about three weeks. and is a big part of the Yankees’ high-powered offense. The Yankees placed Judge in the 10-day disabled list. The problem is that he is a key piece in the Yankees offense and it’s almost impossible to replace his big numbers. This season Judge is batting .285, with 26 home runs, 61 RBI, and a .548 slugging percentage after finishing last year with 52 homers, a .284 batting average, and 114 RBI. In the last two seasons, the Yankees are 5-10 in games without Judge while scoring 3.3 runs per game. That is a big concern for the Bronx Bombers as they have a crucial four-game series against the division-leading Boston Red Sox next week at Fenway Park. The Yankees entered Friday trailing the Red Sox by 4.5 games and losing their best slugger won’t help the Bombers catch them. For now, slugger Giancarlo Stanton will become the every-day right-fielder and will have to carry most of the load for the Yankees, but since this injury comes a few days before the July 31 trade deadline New York could opt to deal for another outfielder or a player to plug at DH in the meantime. The only bright side for the Yankees is that of the next 34 games 27 will be against teams with losing records.